The horizontal back slats that resemble a ladder are what gives this solid wood Ladder Desk Chair its name. Shown in oak wood with OCS-100 natural stain is as traditional as they come. Order yours today with the same options shown or create a more modern look by selecting brown maple or cherry wood as the building material for your new Ladder Desk Chair. The finish color also plays a large role in the style of your furniture. Browse our generous selection of finish colors to find the one that is right for you. Also available with or without arms based on your comfort preferences and on the desk that will be used with your chair. Always make sure the arms of your chair will easily roll under the desk so you're not constantly banging up against it. 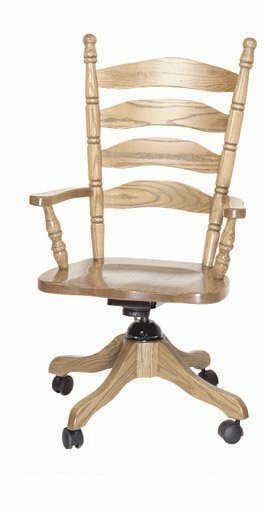 Give one of our furniture specialists a call at 866-272-6773 for additional information on this solid wood Ladder Desk Chair. Height from Seat to Top of Arms: 8"
Height from Seat to Top of Back: 24"
15" to 21" with Standard Lift.